Qari Hussain is the Taliban leader who is known for running suicide camps that train children. "Our movement has gained more strength after the martyrdom of Baitullah Mehsud," he said. "We are united." The militant commander, who appeared to be in his 40s and had a curly black beard and moustache, was surrounded by dozens of other militants and local residents. At one point, he assured those gathered that Islam allowed suicide bombings. The commander said he had been appointed the latest spokesman for the Pakistani Taliban's new chief, Hakimullah Mehsud. He also acknowledged that he was leading a group of suicide bombers known as the "Fidayeen-e-Islam," and said the attackers were ready to give their lives if Pakistan proceeds with offensives in the tribal areas. We have enough suicide bombers, and they are asking me to let them sacrifice their lives in the name of Islam, but we will send suicide bombers only if the government acts against us," he said. Pakistan's northwestern region bordering Afghanistan has provided Islamist militants with safe havens from which to plan attacks on U.S. and NATO troops in Afghanistan. In particular, the mountainous, lawless tribal regions -- where the government wields little control -- are favoured breeding grounds for insurgents, who have also attacked Pakistani government workers and security forces. Pakistan has launched multiple offensives in its tribal regions and other parts of the northwest to root out the militants. 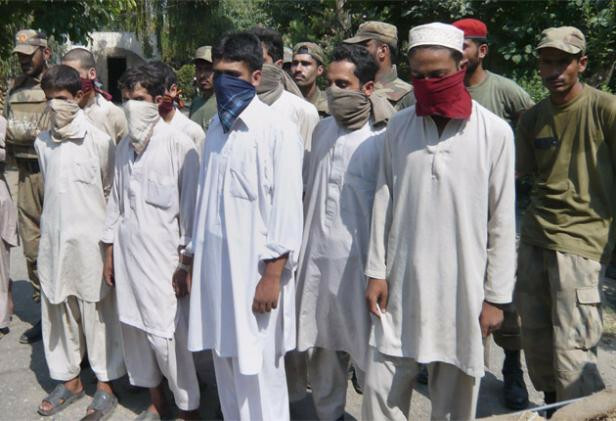 A military statement said Friday that 57 militants surrendered in the Swat Valley over the past 24 hours, and operations led to the arrest of 13 others. It was supposed to launch an offensive in South Waziristan aimed at taking out Baitullah Mehsud earlier this year. But now the army appears content to keep its operations in that region limited since the U.S. missile strike that felled the Pakistani Taliban chief. Militants had transformed a government-run school near the village of Spinkai in South Waziristan into what one officer described as a “nursery for preparing suicide bombers”. The school was part of a large compound above the village that included a small mosque. He told the Dawn newspaper that at another location military investigators found film footage on a DVD that they believed depicts children at the school being taught suicide training. The footage, which was shown to journalists, contained images of a masked teacher instructing rows of schoolchildren who wore white headbands inscribed with Quranic verses. The teacher pointed at the blackboard while an armed guard stood alongside and discussed what to carry in a suicide attack. Maj Gen Athar Abbas, the army’s chief spokesman, said that the school and a hospital had been taken over by militants “to prepare children for suicide attacks and for making IEDS [improvised explosive devices]”. The general said that during operations in the area soldiers had rounded up over 50 boys who were undergoing suicide attack training. He said that many of the boys had been kidnapped. Most of them were from the ethnic Pushtun belt of the North West Frontier Province and that some were locals from South Waziristan. “The boys were handed to an NGO [non-governmental organisation] to be looked at,” said Maj Gen Abbas. He added that in the operation in January the army found jackets and ball bearings used for use in suicide attacks. Mehsud has emerged over the past year as Pakistan’s most notorious militant commander, blamed for a wave of suicide attacks across the country, and has links with al-Qa’eda. He is the head of a network dubbed the Pakistani Taliban - as opposed to the Afghan Taliban - and is accused by Pakistani officials and the CIA of masterminding Benazir Bhutto’s assassination. According to a military official the suicide training squad was organised by a notorious lieutenant of Mehsud, Qari Hussain, who was in charge of indoctrination. Amir Rana, an expert on Pakistan’s jihadi groups, said that Hussain hails from a sub-section, or lesser clan, of the Mehsud tribe. He has been held responsible for taking hostage more than 200 soldiers in the area last year. He is also linked to Sipah-i-Sahaba, a Sunni sectarian group, and was blamed by some security sources for beheading a Shia Muslim soldier. The boys, some as young as nine, have revealed details of how they were induced to become part of the Taliban's army of jihad inside Pakistan and told their rescuers that more than 1,000 children may be undergoing training in the special camp in the Swat valley. Their discovery by the army as troops were sweeping through the valley conducting the final stages of a military offensive against the Taliban underscores the organisation's power over poor Pakistani communities and the extreme lengths Taliban commanders are willing to go to achieve their aims. The rescued children were held at a training camp in the Charbagh area of the Swat valley, where their indoctrination programme reportedly lasted more than a month. Some were recovered as the army was carrying out "search and sweep" operations as part of the final stages of its military offensive in the valley, while others were handed over to the army by worried parents. "When we interrogated the boys, they said that they had been taken hostage by the Taliban by force, or in some cases they were taken to the training camps by their friends," said Major Nasir Khan, a military spokesman in the Swat valley. "They were heavily indoctrinated. When I asked them about what they were told, they said: 'The Pakistan army is the ally of the Western capitalist world, they are the enemies of Islam. The fight against them is justified, they are apostates, the friends of the infidels.'" The boys arrived at the camp by a variety of different routes. Some families had been forced at gunpoint to hand over their children "to fight jihad" during the Taliban's brutal advance across Swat over the last two years. Some groups of young boys were kidnapped in mysterious circumstances, while others were lured in to the Taliban's clutches by the persuasion of their friends. The precise number of boys detained and trained by the Taliban is unclear, but is believed to run in to the high three figures. One of the 20 boys recovered told Major Khan that there were "about 1,200 other boys" at the training camp in Charbagh. The army suspects that there were other camps in operation elsewhere in the valley, including the militant stronghold of Piochar. The boys now in the army's hands have started to give details of the training they underwent at the camps. First it appears they were indoctrinated ideologically: they were shown videos of atrocities being carried out across the Muslim world, from Palestine to Chechnya and the Middle East. "They were shown these images to develop a hatred of Western countries," said Major Khan. The Taliban militants would then gauge their levels of intelligence and physical strength before dividing the young boys into separate categories. The first group was used as local informers who would patrol the streets of the valley gathering information. One of the boys interrogated said he was given a pistol and told to monitor the Pakistan army's troop movements.